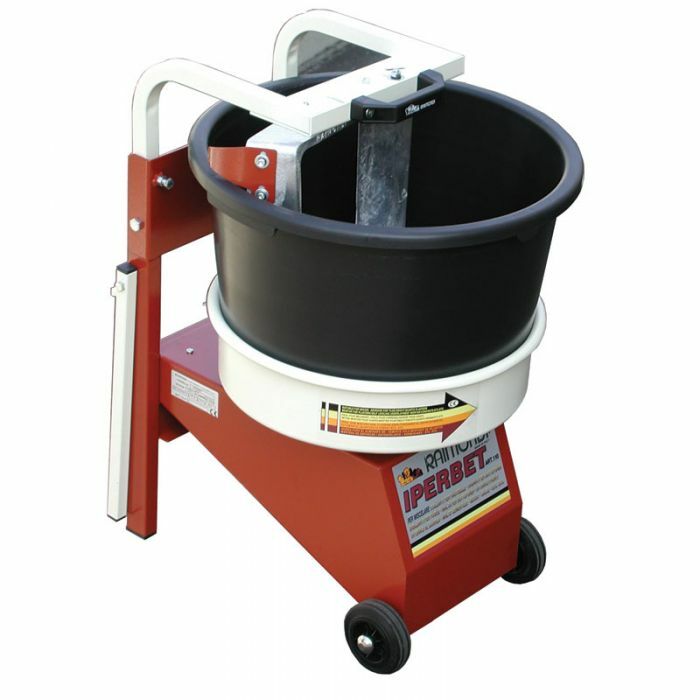 This low RPM mixer is ideal for mixing grout, thin set or mud mix at the proper speed, preventing air pockets from entering into the mixture. The unique fixed blade design mixes by rotating the bucket rather than the paddles, allowing you to safely check the mix and pour more product without stopping the mixer. This low RPM mixer is ideal for mixing grout, thin set or mud mix at the proper speed, preventing air pockets from entering into the mixture. The unique fixed blade design mixes by rotating the bucket rather than the paddles, allowing you to safely check the mix and pour more product without stopping the mixer. The motor is located beneath the metal shroud, ensuring the unit is balanced at all times and prevents contact with the motor or gears. Mix 50 to 100 lbs. dry power per load. It comes with two 11.8 gallon buckets and weighs only 75 lbs. With dimensions equaling 21" x 25" x 32", two wheels, and a well positioned handle, it's an easy way to complete all your mixing needs with less fatigue on the worker.